Peter Pan has enchanted children and the young-at-heart ever since it debuted on the English stage. Like its ageless hero, this is a fantasy that will live forever. Wide-eyed readers will follow Peter and the Darling children to Neverland, that wonderful place ""second to the right and straight on to morning, where they'll meet such unforgettable characters as the jealous fairy Tinkerbell, the evil Captain Hook, Tiger Lily, and the Lost Boys. 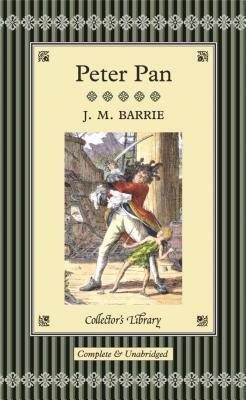 Also included in this edition is Peter Pan in Kensington Gardens, the touching fairy tale in which Barrie first introduced Peter. Illustrations by the legendary Arthur Rackham and F.D. Bedford. The world's greatest works of literature are now available in these beautiful keepsake volumes. Bound in real cloth, and featuring gilt edges and ribbon markers, these beautifully produced books are a wonderful way to build a handsome library of classic literature. These are the essential novels that belong in every home. They'll transport readers to imaginary worlds and provide excitement, entertainment, and enlightenment for years to come. All of these novels feature attractive illustrations and have an unequalled period feel that will grace the library, the bedside table or bureau.